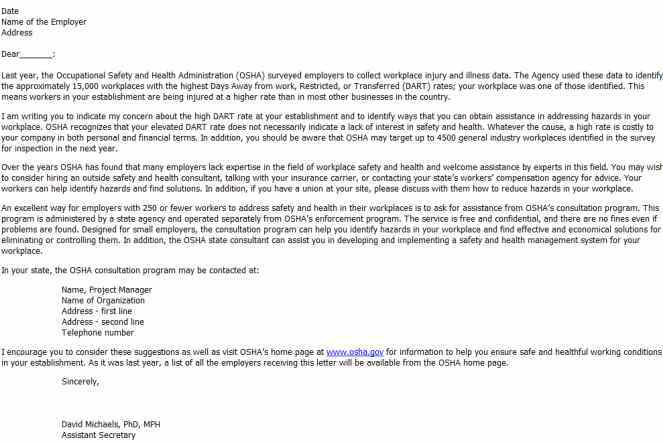 OSHA recently sent out 15,000 letters to workplaces with the highest DART (days away, restricted, transferred) rates. (For a DART calculator, see OHShub.com’s post HERE). For every 100 full-time workers, the 15,000 employers had 4.5 or more injuries or illnesses which resulted in days away from work, restricted work or job transfer. The national average is 2.0. For a list of the 15,000 workplaces, click HERE.